As all of you know, I'm a big fan of basing and really looking at what it can do for your models. 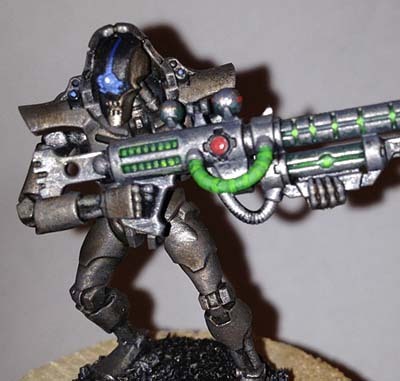 I want to take a minute to share some Necron Deathmasks that were shown to me by a reader who was looking to go that extra step with his Necron force. 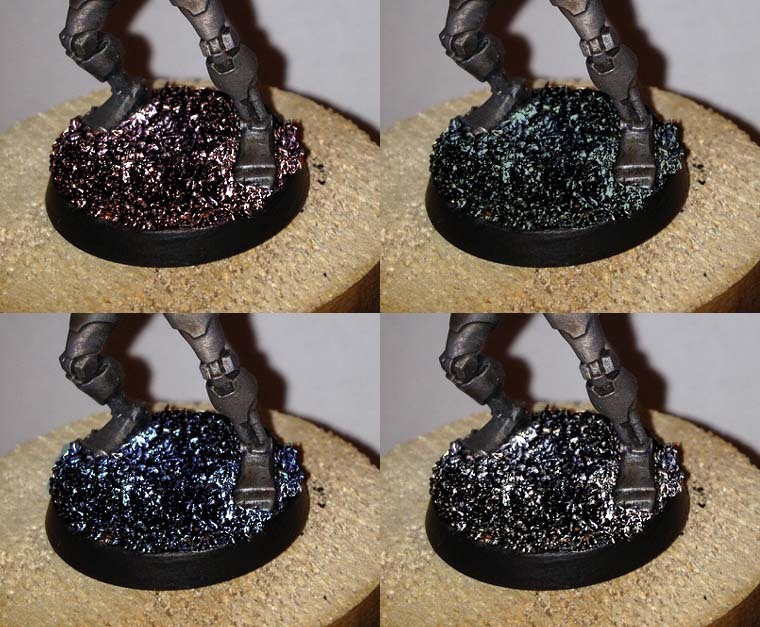 Looking back at the previous post I did on basing color concepts, we can see that he's gone with the dark model on the dark base. 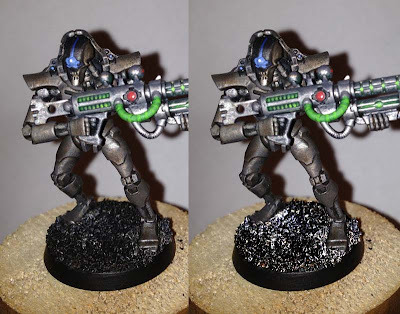 A perfectly suitable look for Necrons if there ever was one. But now that the two elements blend together since both are dark, the question becomes how to differentiate between them so the model and base don't appear as one undefined blob. Texture is the way to go here. Color could be introduced, but just bringing out the difference in texture between the smooth surfaces of the Necron model and the rough surfaces of the base will add that extra dimension and help finish off the model. Here's what the model looked like before and after changes were made. I went in and did some photo editing to simulate the effect of simply drybrushing the textured base with a lighter grey color to bring out the rough texture on it. Doing this brings a little bit of contrast to the base, emphasizes the texture so we can quickly identify the "world" or environment he is in, and helps us see the model separately from the base. Sure, they both are dark and blend together, but we are moving away from them looking like the blob shape we don't want. Nothing says you have to stick to light grey for drybrushing the base texture. You could introduce some light blue or tans to your drybrushing to create a cooler or warmer feeling to the environment as well. If drybrushing doesn't introduce the amount of color you want, you could try a wash over the base to add some color to it as well. We aren't looking to color the whole base, just add a hint of it to bring it to life. You could add some warmth (using warmer colors when drybrushing) to a base with a cool colored model to increase the contrast and make the model pop even though both are dark overall. And the same goes for using a cool color which would unify the model and base. Lots of folks switch over to autopilot with this important part of basing. Whether you have a preferred choice or a default color you use all the time, it can be worth the effort to try a different color or two when you're all done to see what the effect is. In this case, painting the rim of the base a medium grey color instead of black lightens the whole model overall. While you may end up going with black, it can't hurt to see what some others colors do for the overall feel of the model and army. 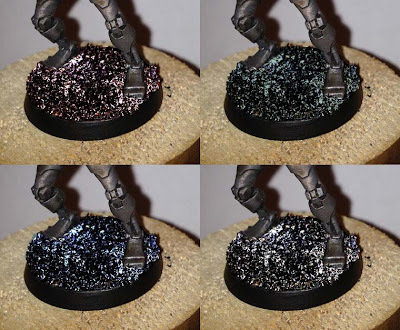 It comes down to taking a minute when you're doing your basing and looking at what one or two things you can do to really push your model that last step. It doesn't have to be anything crazy, complex or time consuming since all we did here was simulate a quick drybrush and painting the rim of the base. Adding that last touch might take your army from looking good to great and it shouldn't require a huge investment on your part. Nice! I went with a little bit different approach. I use Brights and Brights. I went out and spent $12 on some corkboard and here is the result. HiveTyrant36: And it works perfectly fine. I like the lava effect using cork board for the rock outcroppings... nicely done. I basically went over the base sand with a bit more Leadbelcher where it was darkest, and then a very gentle (in some cases...) dry brush with Runefang Steel. The base rim was coated in two coats of Eshin Grey. Darren: Ahhh... went with the dark model/light base combination. Very nice. And you don't see Necrons on snow very often either. MarkLNZ: Wonderful! They look great. 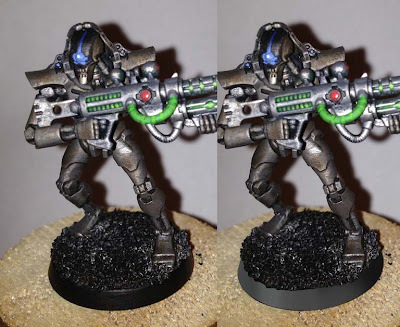 The models have a much warmer look to them in that pic which contrast nicely against the cool metal on the base. And the dark grey rim on the base is perfect. Interesting stuff (as ever), especially the bit about the colour of the base edges - thanks, Ron!